MAE SAI, Thailand -- (KFSN) -- Rescuers in northern Thailand on Sunday extracted at least four members of a youth soccer team from the cave where they had been trapped for more than two weeks, part of an ongoing operation to rescue the 12 boys and their coach, officials said. Chiang Rai acting Gov. 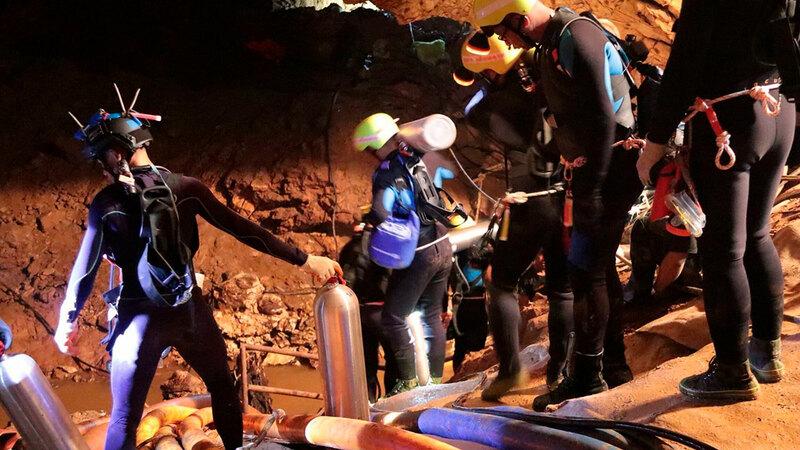 Narongsak Osatanakorn, who is heading the operation, said that 13 foreign and five Thai divers were taking part in the rescue and that two divers would accompany each boy as they're gradually extracted. "Divers will work with doctors in the cave to examine each the kids' health to determine who should get to come out first," Narongsak said Sunday morning. "I confirm that we are at war with water and time from the first day up to today," he said Saturday. "Finding the boys doesn't mean we've finished our mission. It is only a small battle we've won, but the war has not ended. The war ends when we win all three battles - the battles to search, rescue and send them home."